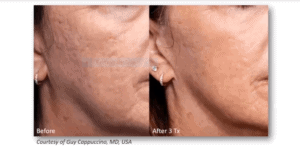 Genius is a true breakthrough, combining the proven benefits of both micro-needling and RF (radiofrequency). 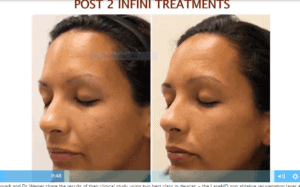 It combines these two treatments into one, and elevates the sophistication of the device leading to greater results than we have ever seen from either treatment on it’s own. This is High Precision RF Micro-Needling. At the start of each treatment a new precision needle tip is attached. It contains a cluster of stainless steel needles that are gold plated (this conducts the RF energy) and insulated (to protect the outer skin, leading to shorter recovery times and our ability to treat all skin types). The machine helps the operator select settings such as gender, age and skin color (Fitzpatrick typing). Then based on location (upper face, lower face or neck) the machine safely guides the operator to treat each patient with three complete passes. Each pass is automatically set for different depths, ensuring that over 30% of the entire dermis is exposed to therapeutic levels of controlled injury. Radio-frequency uses radio waves as the source of energy to treat the skin (not light or laser). RF heats the dermal skin with controlled temperatures of between 60-75 degrees Celsius. Prior to this we were limited to achieving temps in the low 40’s. This higher level of heating is in the sweet spot for maximal production of new collagen and elastin. 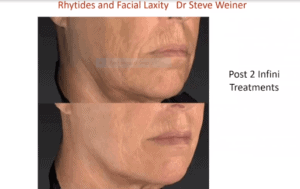 Within a week patients see firming and tightening of the neck and jowls, and this benefit continues to build over several more months. 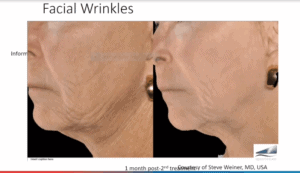 We are seeing tightening and firming of the face and neck that is simply incredible. Look at the amazing result after only 3 treatments to the neck. Please note these images were achieved after use of Infini, the precursor to Genius. 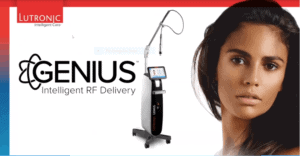 Genius is a big step up from Infini with new built in safety features that uses feedback from the patient’s own skin. The result is maximum results and safety for the patient. Deep wrinkles and lines also improve with Genius. 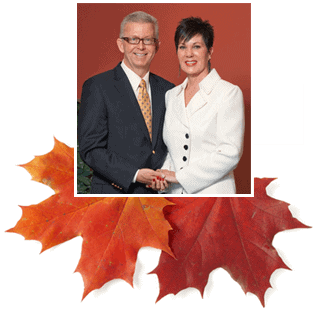 These are Dr. Steve Weiners results in a patient after only 2 treatments. 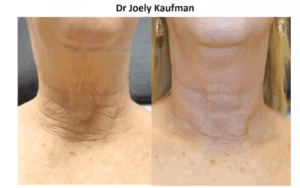 Another remarkable result, courtesy of Dr. Joely Kaufman. These are doctors who participated in landmark trials that led to the FDA clearing the Genius device. Genius preserves and protects the outer skin that we call the epidermis. Other RF devices traumatize the outer skin, leading to more pain, long recovery times and the risk of changing a persons natural skin pigment. Genius on the other hand is very intelligent, allowing us to treat any skin type! That’s Genius! I am excited to have a new treatment that will also work on mature skin – people over the age of 50-60 who are looking for firming and tightening. Genius is a treatment that we can offer with confidence to people of all ages! Dr. Steve Weiner states “Genius is the new gold standard for treatment of acne scars.” Genius is safer than laser, leads to results with fewer treatments and can be used all times of the year and on all skin types. Dr. Weiner would know about treating sun damaged and tanned skin as he has an office in Florida. Carter Abbott MD and Sonia Sublett-Adams APRN want to bring this technological breakthrough to Omaha Med Spa at prices that everyone can afford. Package Deal: Buy 3 treatments Face and Neck for a Total of $2,400 and get a 4th treatment for FREE! (That’s $6,000 work of Genius treatments for Only $2,400) Ask about our in house finance plan so you can get your first treatment done right away!